Fears among investors of significant regulatory tightening this year in the Macau casino market have not been realised so far, suggested a Monday note from Union Gaming Securities Asia Ltd.
Another institution, JP Morgan Securities (Asia Pacific) Ltd, had said in a memo earlier the same day that Macau’s worse-than anticipated second-quarter market performance had seen the average share price of seven Macau-related gaming companies followed by JP Morgan decline by about 18 percent. That brokerage however stated it remained bullish on the Macau casino sector. In a July 1 note, Union Gaming had mentioned it expected 16 percent expansion for the year, one percentage point fewer than its previous forecast. On Monday the institution mentioned it was also reducing its 2019 gross gaming revenue (GGR) forecast slightly, to 12 percent year-on-year improvement. Mr Govertsen then made reference to a raft of recent reports that had indicated a heightened official clampdown on unlicensed foreign exchange dealers, as well as action against use of certain China UnionPay Co Ltd money transfer terminals at some Cotai casino premises. Most bets in Macau casinos are denominated in Hong Kong dollars, and customers from mainland China need to have some way of converting their mainland Chinese-currency denominated assets into Hong Kong money in order to play. In addition, limits on cross-border cash movement – both for that held in person and that transferred electronically – have spawned an elaborate range of ad hoc solutions said by commentators to bend or sometimes even break the rules. Mr Govertsen wrote: “Money exchange kiosks on the China side of the border have reopened, while Cotai UnionPay shops are generally operating as usual.” That was a reference first to reported recent enforcement on the Zhuhai side of the border, against touts providing services to outbound mainland Chinese; and second to a recently-reported clampdown on use of UnionPay terminals in certain jewellery shops, whereby reportedly customers can buy high-value items by card, and then return the goods for a cash refund that can fund casino play. The latter was a reference to the Macau casino regulator, the Gaming Inspection and Coordination Bureau, also known as DICJ, which on Monday issued data on the market split between VIP and mass-market gambling in the second quarter, and by extension, the relative year-on-year growth rates for those segments. 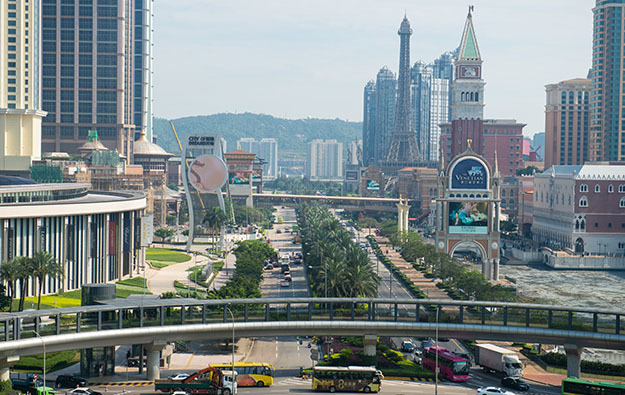 The data showed that GGR in Macau’s VIP segment expanded by 14.4 percent year-on-year in the second quarter, while that for mass play – including slot machine play – was 20.8 percent. As an example of the latter costs referred to by Morgan Stanley, on Friday Macau operator Wynn Macau Ltd had announced it would pay on August 15 what it termed a “special bonus” equal to one month of gross salary, for 95 percent of its workers. Japanese brokerage Nomura said in a Monday note referring to the second-quarter market split: “The stronger mass growth should be viewed positively vis- à-vis government’s stated priority.” The Macau government has said it wants to see a diversification of Macau’s tourism offer. According to some investment analysts, that has been read by the local casino industry as a signal that it should foster lower-stakes mass-market play, which has the benefit of robust margins because player reinvestment costs are lower compared to VIP gambling under so-called rolling chip programmes. The Nomura team said it expected 10 percent year-on-year expansion in aggregrate Macau GGR in July. The latter was a reference to the 2018 FIFA World Cup, an international soccer tournament held from mid-June to mid-July this year, that some analysts had suggested had a dampening effect on Macau casino gambling demand. A Monday note from brokerage Sanford C. Bernstein said it anticipated July GGR in the range of MOP25.8 billion (US$3.19 billion) and MOP26.1 billion, an estimated increase of 12 percent to 14 percent year-on-year.